Surgical training in England is once again in the midst of a vast upheaval. The introduction of the European Working Time Directive (EWTD) combined with shortened training time poses problems with regards to sufficient exposure to procedures for surgical trainees. This clearly has implications with regards to the role of the surgeon as an endoscopist, particularly given the expectation that these same surgeons will lead the development of NOTE surgery. Having already surveyed the views of surgical trainees in the Oxford region in this regard, we now intend to present the findings from extending this questionnaire nationwide. 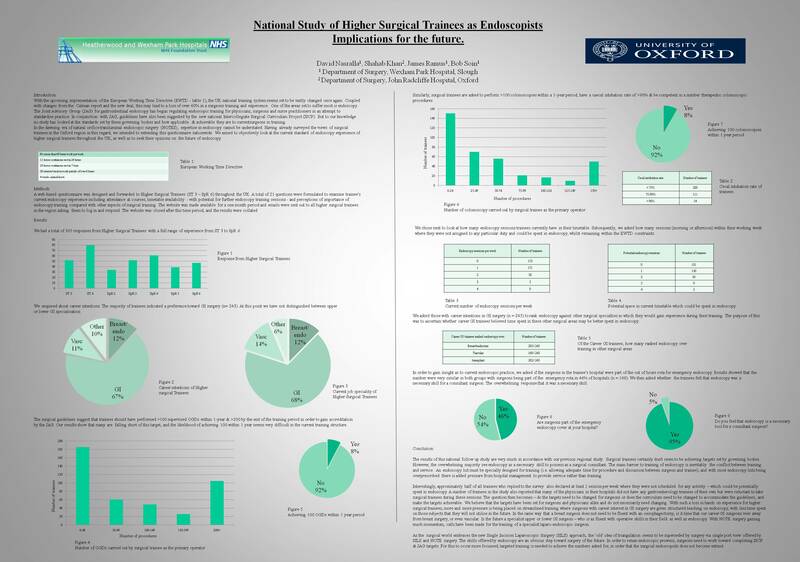 A web-based questionnaire was designed and forwarded to surgical trainees throughout the UK. This examined trainee’s current endoscopy experience including attendance at courses, timetable availability – with potential for further endoscopy training sessions – and perception of importance of endoscopy training compared with other aspects of surgical training. Our nationwide study has very much re-iterated the findings of our preliminary survey of trainee surgeons in the Oxford region, suggesting that GI trainees feel that endoscopy skills are desirable and necessary for future surgeons, particularly given their role in the on-call rota. However, very few are attaining the number of gastroscopies or colonoscopies required by the ISCP. Less than a quarter had dedicated weekly endoscopy sessions, although many trainees did have free time in their timetable, whilst still being EWTD compliant, in which further specialisation could be undertaken. It seems clear that in order to retain endoscopic prowess under the restrictions imposed by the EWTD, surgeons need to work towards completing targets set by governing bodies worldwide. In the dawning era of NOTE surgery, the importance of surgeons as endoscopists cannot be undervalued and more emphasis is needed on its training if we wish to advanced as endoscopists, as well as NOTE surgeons, in the future.